Today I was hiking because we had sun and it looked a bit like spring. I didn’t take a lot of photos over the winter, instead I uploaded some that I shot previously. Winter can be great and there are some interesting subjects during this time as well, but this winter I was not in the mood to go outside with the camera very often. But the weather was good today and with spontaneity I grabbed my camera and went outside. 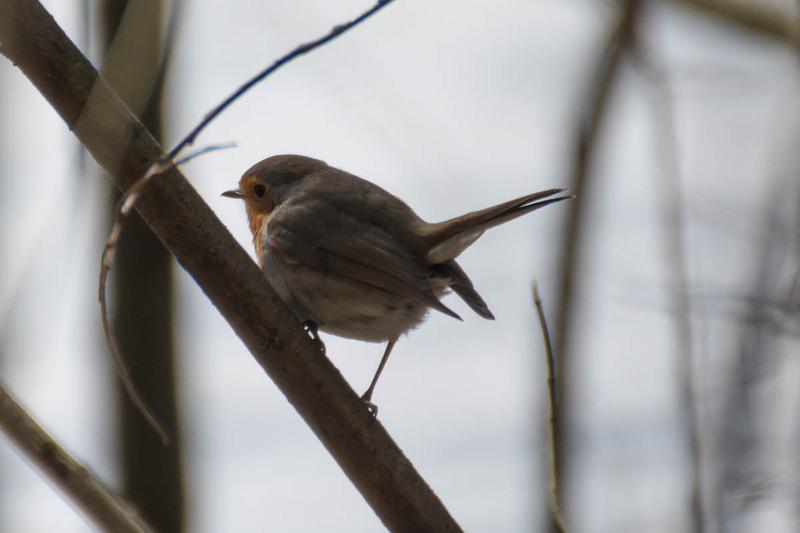 I shot some photos of birds, including the photo of the European Robin that you see in this post. But it was not easy today, the birds were way too active, and after some miles it got cloudy. But I enjoyed the hike, I can’t await to do that more often again when the weather stays good. [ Smiles ] That is one cute-looking Robin. True 🙂 But this one gave me a hard time. Hectic little bird 🙂 There was always something in front of the Robin, but then I got the image above and was happy.